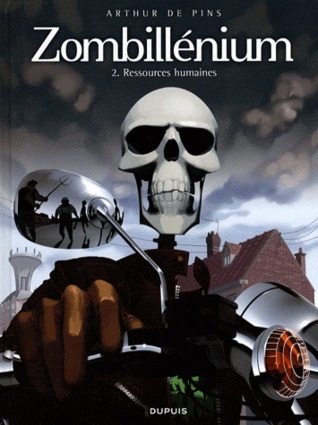 Zombillenium Vol 1. Gretchen by Arthur de Pins was so awesomely amazing that I ran out and got Vol 2. I am happy to report that the crazy hijinks continue. Tempers are flaring around Zombillenium, the amusement park run by monsters. When one hires only the witches, vampires, werewolves, and other undead in a region where unemployment is in the double digits, one must expect some friction. But things get particularly ugly when the park’s security is breached from two sides: activists and a very strange visitor. Dun-DUN-DUUUUUUN!!!! What the what?!?!? This was just as awesome as volume 1. I was kinda thinking that volume 1 was a fluke and volume 2 couldn’t be as good, right? Wrong! This might even be better than the first one. August 1, 2015 cannot come soon enough! That is when the next volume comes out. Have I mentioned that I cannot wait?!?!? This entry was posted in Ghost, Graphic Novel, Magic, Monsters, Paranormal, Vampires, Werewolf, Witches, Young Adult, Zombie and tagged Arthur de Pins, Zombillenium. Bookmark the permalink.